What can I say about a boutique hotel with extraordinary views, a perfect close-to-town location, good service and nice breakfasts? We arrived one Monday night in early September and rented a car at the airport for our 10 to 15 minute drive to the hotel. Driving on Mykonos is not super easy to become acclimated to if you're used to the U.S. There are very narrow streets, often too narrow for two-way traffic and lots of twists and turns and sometimes dirt and no parking on long stretches of road. Add the darkness of night time to this and you feel like maybe you made a mistake by renting a car in the first place...even a small one. The hotel is located on a narrow street with no clearly marked place to park, although if you look carefully there is a gated parking platform on the lot next to the hotel sign, both of which are difficult to see at night. We ended up parking two blocks away and walking to the hotel with our luggage. Once we got to check-in, they told us about the parking; but there was no sympathy for the stressful drive from the airport. This is Mykonos and get over it! Also, be prepared for a snide comment about only renting a classic room as opposed to a deluxe room or suite (the Mykonos version of upselling?). Regardless, the Classic Room was just fine and... What can I say about a boutique hotel with extraordinary views, a perfect close-to-town location, good service and nice breakfasts? We arrived one Monday night in early September and rented a car at the airport for our 10 to 15 minute drive to the hotel. Driving on Mykonos is not super easy to become acclimated to if you're used to the U.S. There are very narrow streets, often too narrow for two-way traffic and lots of twists and turns and sometimes dirt and no parking on long stretches of road. Add the darkness of night time to this and you feel like maybe you made a mistake by renting a car in the first place...even a small one. The hotel is located on a narrow street with no clearly marked place to park, although if you look carefully there is a gated parking platform on the lot next to the hotel sign, both of which are difficult to see at night. We ended up parking two blocks away and walking to the hotel with our luggage. Once we got to check-in, they told us about the parking; but there was no sympathy for the stressful drive from the airport. This is Mykonos and get over it! Also, be prepared for a snide comment about only renting a classic room as opposed to a deluxe room or suite (the Mykonos version of upselling?). Regardless, the Classic Room was just fine and the window looking out over Mykonos Town had a great view. The room was comfortable, but not luxurious. The buffet breakfast in the morning was good and be sure to take advantage of special orders of omelettes, expressos, cappucchinos...etc..all included. The kitchen staff and servers are especially pleasant and accommodating. The buffet consists of a generous continental breakfast. With special orders, you can make it nearly a full breakfast. After a few days, we decided we wanted to take a tour of Delos, a tiny island that is an UNESCO World Hertage site about 30 to 40 minutes by ferry from Mykonos. We decided to make the reservations through the hotel, which required non-refundable cash payments. Unfortunately, for reasons I do not have time to mention (see link below), but through minimal, if any, fault on my part, I missed the tour but did not get a refund or an apology from the tour operator. The hotel staff, although apologetic, did not provide any compensation or help with negotiation. After the description above you would probably ask if I would stay at this hotel again and my answer would be.....probably yes. The price you found is 30% lower than this hotel's average rate of $180/night. The price you found is 25% lower than this hotel's average rate of $170/night. The price you found is 26% lower than this hotel's average rate of $215/night. The price you found is 43% lower than this hotel's average rate of $316/night. The price you found is 42% lower than this hotel's average rate of $202/night. The price you found is 20% lower than this hotel's average rate of $264/night. I wish i could live at this hotel! This was the welcome to Greece that I was so happy to receive! At check in the staff were so lovely & helped me with my luggage to my room. The room was so stunning, perfect for what I needed. It had a beautiful balcony that I could see the pool & windmill from. The bathroom was great, although the towel rail was a little high for a shorty like me. The shower was huge & had an amazing waterfall showerhead - just what I needed after 28hrs of travelling. Then I went down for breakfast the next morning - OH MY GOODNESS!!! That view, beyond words! I could have sat there all day. Then the actual breakfast food - WOW! I think I put on 5kgs just from my 5 night stay haha! The food was all home cooked everyday & you could tell it was done so with a whole heap of love. The yogurt, the marmalade, the cakes & salads - I wish I could go back right now. The staff were all so incredibly lovely & I actually didn't want to leave them, I even face-timed my family at home with them because I had to introduce them to the people who were looking after me. 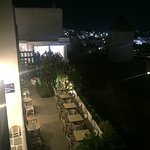 The location is perfect, its the last road that cars have access to so you can get a taxi to the door unlike all the other Mykonos hotels that you have to drag your luggage through the streets to find. The walk down to town literally takes 2 mins. Do yourself a favour & stay here! We come to this fantastic hotel for third year now and count the days dreaming of our next visit. The hotel is pefectly situated overlooking the town of Mykonos and at the same time far enough from the party noise of the place. Very nice hotel in the typical Myconian architecture, very clean with excellent, helpful staff. Perfect stay in Mykonos! You will love location, room, views and breakfast! Our stay was perfect in this extremely spotless Boutique hotel. We took a $15 taxi ride to this hotel just right off the road from the New Port. We were greeted by Shuman who carried our luggage to our room. Shuman was awesome! The hotel is just off the road which makes it very easy to get too and it's actually very quiet. The hotel staff are very attentive and always busy keeping the hotel and grounds immaculate! Rooms are always cleaned early and they even turn down your beds in the evening when your out. The staff behind the desk was always available to help with questions. It was nice to have to keep your key at the desk when you went into town so you didn't have to worry about loosing or caring around. Our room was perfect, bright, roomy and completely spotless. Nice to have a desk with mirror in the room. A roomy closet with fridge. Very comfortable bathroom with a great shower. Totally recommend getting a room with a view and a balcony. Not sure I would want to stay in one of the back rooms with no view but if your on a budget I'm sure it would be fine. Breakfast was amazing! The cook would take orders for eggs every morning and would be something special or different each day. Her orange marmalade was amazing. Even the cheese cake one morning that was delicious. They have a nice sunset bar you can sit in when you want to get away from the wind. The location is walking distance to everything. You will have to walk many steps but you have to expect that when traveling to Mykonos. It really isn't that bad and you find different routes to get to room. It's nice to have the windmills close for reference when walking back. We loved our stay. The staff is really great and the cleanliness is outstanding. Room tip: Request a room with a view for sure! I've been to Mykonos four times and have stayed in different places in town each time but this time was my absolute favourite! Portobello is modern, clean, has an incredible view and is in an amazing location. You can walk to the heart of town in 5-10 minutes (be warned that it is an uphill walk to get back but it does have steps along the path). The staff is extremely friendly and certainly take care of their guests. The breakfast is delicious and has a good variety. One downside is that the pool is only for the private villa, but if it's not rented you are allowed to swim in it. It's also true that the rooms are small, but it is definitely not an issue for the amount of time spent in the room anyway and all the other perks make up for it (they even come with robes!). The terrace at the front of the hotel is amazing to have some drinks and watch the sunset. Overall, Portobello is amazing, it's not cheap, but nothing in Mykonos is! For all it has to offer, the price is worth it to stay at this beautiful place! 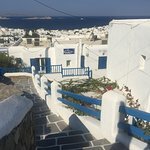 This is where to stay in Mykonos! 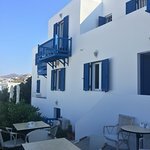 There are several reasons this is the place to stay in Mykonos: clean, air-conditioned rooms with a beautiful view if you wish to pay for the view. We opted for a room without a view as there is a nice terrace for everyone to use as well as an air-conditioned bar area with the same view - both available to all guests. There is not a better view in Mykonos of the sunset, Old Town, and Old Port. Location is great! - easy, quick walk to the beautiful Old Port area leading on to the quaint streets of the Old Town, Little Venice, and the line of windmills. The 24-hour reception desk staff is wonderful. You will find that to be true even before you arrive as they are quick to reply to email questions and arrange transports to/from the hotel to port and airport. We have saved the best for last - the fantastic breakfast, much of which is homemade (like the yogurt, orange marmalade, breakfast filo-pastry apple strudel). We thank the staff of this wonderful hotel!